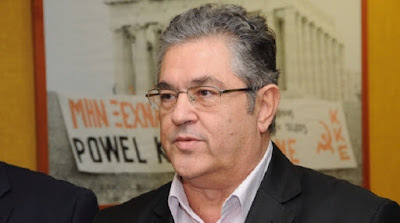 Dimitris Koutsoumbas, the General Secretary of the CC of the Communist Party of Greece, has expressed his deep concern about the danger of Greece's direct engagement in a war, during an interview with the newspaper “Ethnos” on Sunday. Koutsoumbas accusses the SYRIZA-ANEL coalition government for cultivating an environment of complacency regarding Turkey's escalated aggression. Responding to those who repeat the argument that Greece's membership in NATO consists a “factor of security”, the KKE Gen. Secretary reminds that NATO and the EU are responsible for border changes in the region since 1990s, always through wars and with the people's blood. The KKE has consistently expressed its concern about the Turkish provocation and agressiveness, for NATO's dangerous plans, highlighting the causes of all these, unlike the SYRIZA-ANEL government which follows a tactic of complacency and concealment. Because, behind Erdogan's “internal consumption” arguments expressed by government officials, there is the attempt of the Turkish bourgeois class to upgrade its position, in contrast with the Greek bourgeois class, in a region where “knives are pulled out” between imperialist powers and powerful capitalist states, such as the US, the EU, China, Russia and others. And that, in simple translation, means danger for Greece's direct involvement in warfare. The General Secretary of the KKE also denounced NATO's “Pontius Pilate” stance in the case of the two Greek soldiers who remain detained by Turkish authorities in Edirne.